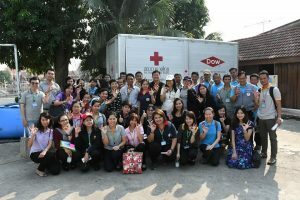 In the past few years, the Thai Red Cross Society (TRCS) has been conducting the National Disaster Response Team (NDRT) for the TRCS staffs from Red Cross Chapters, Red Cross health stations, and relevant network, in order to meet TRCS’s minimum standard in assisting affected people during disaster. 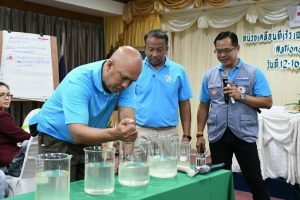 There are 149 TRCS staffs from different region of Thailand who have been trained and are ready to be deployed for disaster response. Funded by USAID and technically supported by IFRC, TRCS conducted the third (final) NDRT training during 12-16 March 2018 with the focus on Water and Sanitation (WATSAN) and Public Health in Emergency(PHiE). The objective of this training was to build the capacity of TRCS Headquarter and provincial staffs (Health stations) in assessment, planning, implementation, and coordination of WATSAN and PHiE interventions. The participants were TRCS staff who had already been trained as NDRTs in the last two introduction courses. Total 34 participants (F 25, M9) attended this training. iv) Increase of TRCS pool of WATSAN and PHiE specialists. The training contents include: Assessment Analysis, Emergency Plan of Action, Quality Test and Practice Lab Test, Water Supply, Site Selection, and Water Filtration System. 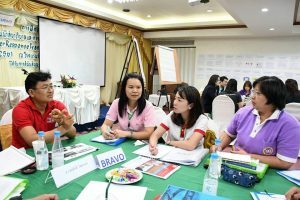 In addition, there is a sectoral Coaching based on EPOA on; Impact of Health in Emergency Epidemiology and Communicable Diseases, Mental Health, Psychosocial Services and Reproductive health, Excreta disposal, Sanitation and Water -borne disease/water and excreta-related disease, and transmission mechanism and Hygiene promotion. TRCS demonstrated how to make clean water during disaster with the water mobile unit. TRCS received a good collaboration from the Health Department, Ministry of Health to deliver one session about Quality Test and Practice Lab Test. One speaker from Dow Chemical Company to deliver the session on Water Supply, Site Selection, and Water Filtration System. By the end of training, participants were able to develop assessment need analysis and Emergency Plan of Action-EPOA (followed IFRC’s template) based on scenario and information provided by sectoral coaching.